Where did the money really go? A look back at a cheated customer’s story from 2016 – not shared here before. It’s another reinforcing story about Cochran’s bad deeds. I had no idea Beagle was basically being pushed to exhaustion, all the money from the lovely things there filtered away from him and into Cochran’s pocket, and that anyone Beagle tried to talk to alone would get Cochran telling them how old and confused he was — including cutting Beagle off from his own family. That Cochran, after getting Beagle out from under a predatory contract, turned around and preyed on him all over again. 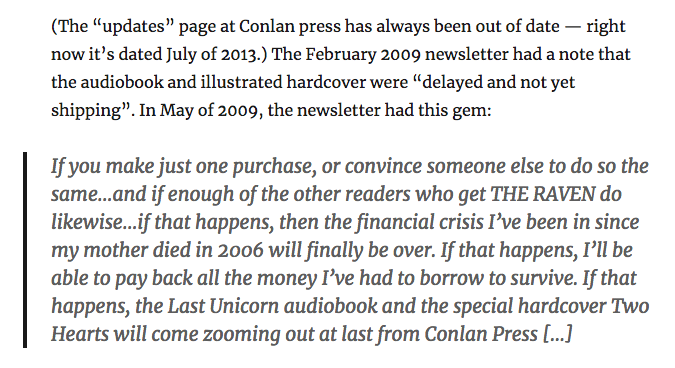 I had no idea, since I wasn’t planning to buy anything that wasn’t on the table at the time, that many, if not all, of the people who did sign up to pre-pay for special packages have never received them, that Cochran keeps promising late and later dates. Up to 12 years. Keep Peter in your thoughts and wish him success. What an amazing christmas present it would be to finally get the victory he deserves. 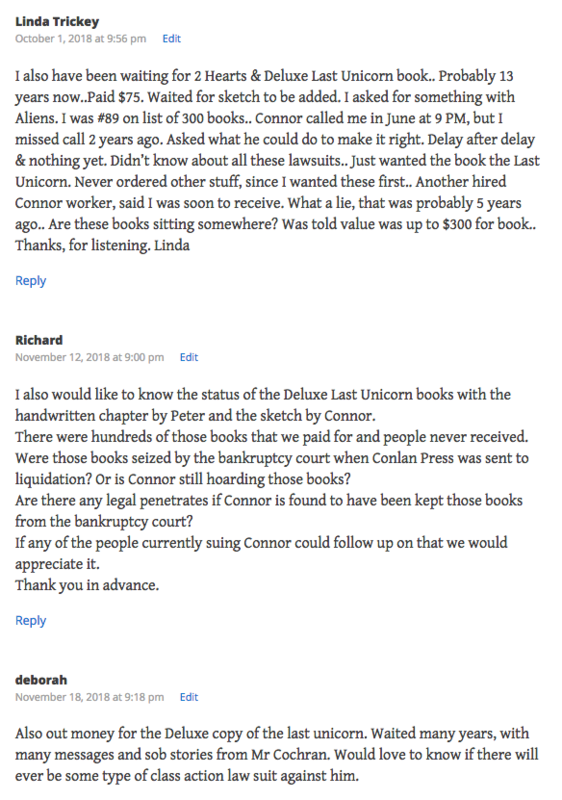 ← Connor Cochran dropped by FIFTH attorney; and where did Peter Beagle’s money go?